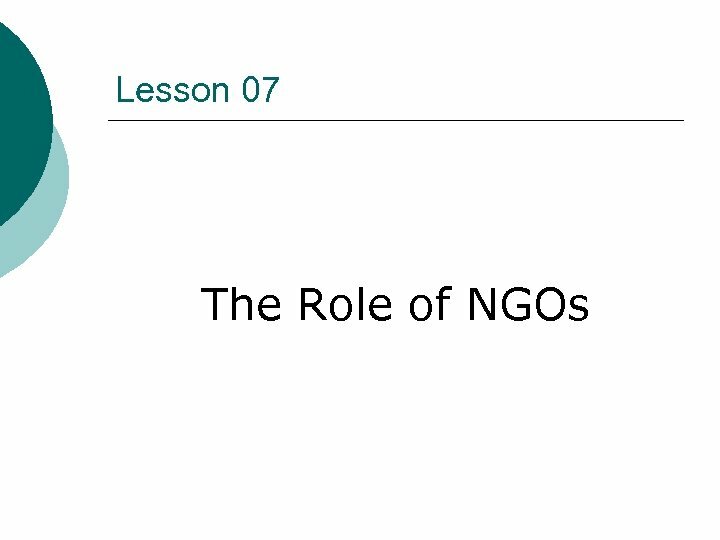 Chapter Learning Objectives This lecture will throw light on the role of NGOs in development of SMEs in Pakistan. 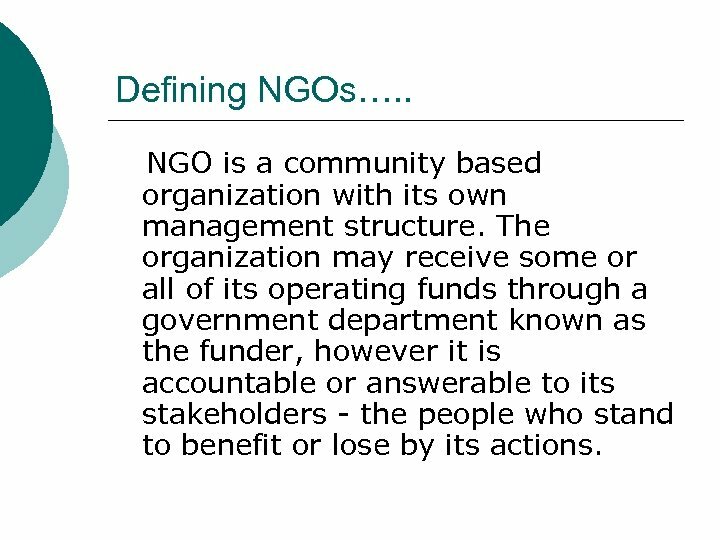 Defining NGOs……. ¡ They normally work through grants, aids or donation based finances. ¡ They are having a very constructive role in the SME development. ¡ The special belonging of this sector is gender development. 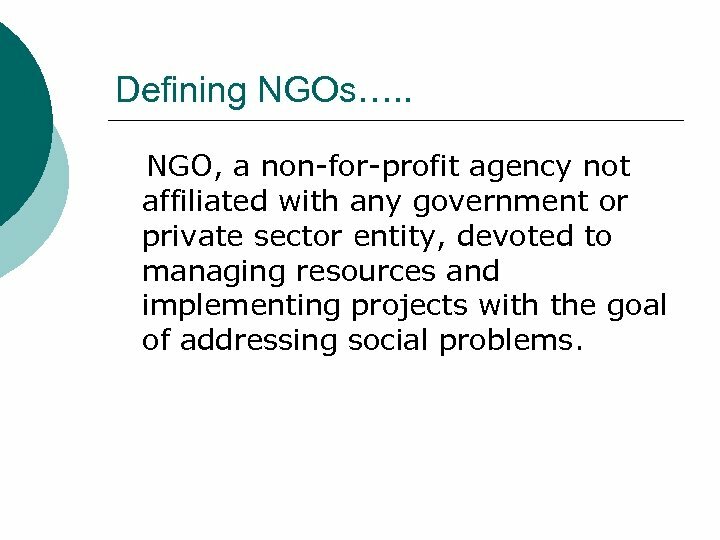 Defining NGOs…. . NGO, a non-for-profit agency not affiliated with any government or private sector entity, devoted to managing resources and implementing projects with the goal of addressing social problems. 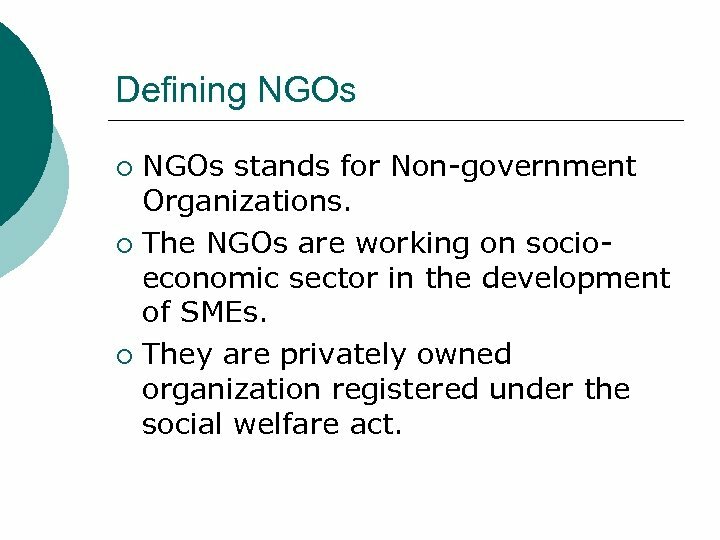 Defining NGOs…. . NGO is a community based organization with its own management structure. The organization may receive some or all of its operating funds through a government department known as the funder, however it is accountable or answerable to its stakeholders - the people who stand to benefit or lose by its actions. Continued……. 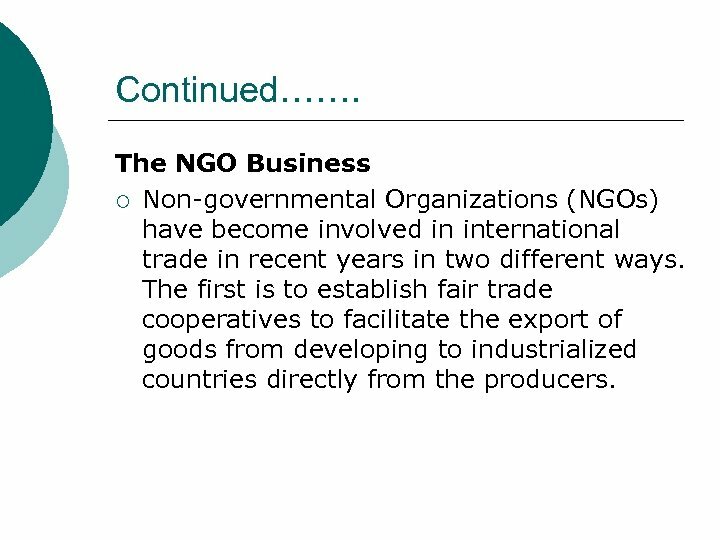 The NGO Business ¡ Non-governmental Organizations (NGOs) have become involved in international trade in recent years in two different ways. The first is to establish fair trade cooperatives to facilitate the export of goods from developing to industrialized countries directly from the producers. Continued… Another less well-known NGO business strategy is for the NGO itself to take on the role of designer, marketer and distributor of specific products and to work with particularly disadvantaged groups, primarily women, as subcontractors who are taught to produce the goods that the NGO sells. 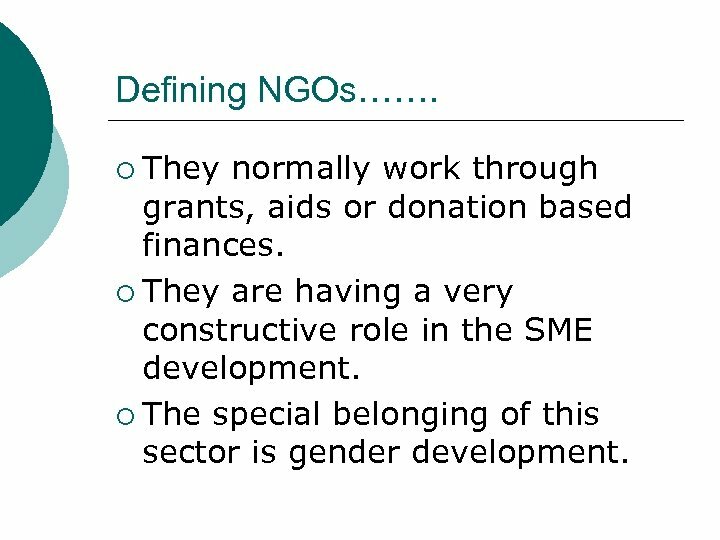 Continued……. . NGOs differ from standard private sector producers is in their selection of subcontractors and the fact that all profits are invested back into the organization to ensure organizational sustainability and to expand their base of subcontractors. 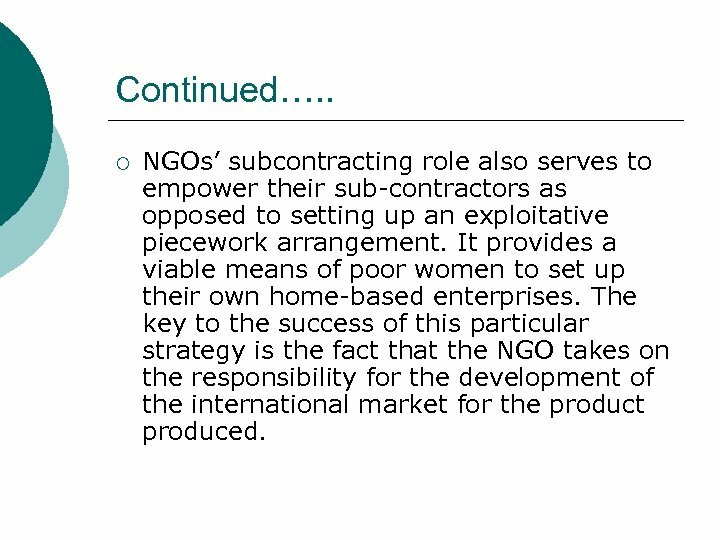 Continued…. . ¡ NGOs’ subcontracting role also serves to empower their sub-contractors as opposed to setting up an exploitative piecework arrangement. It provides a viable means of poor women to set up their own home-based enterprises. The key to the success of this particular strategy is the fact that the NGO takes on the responsibility for the development of the international market for the product produced. 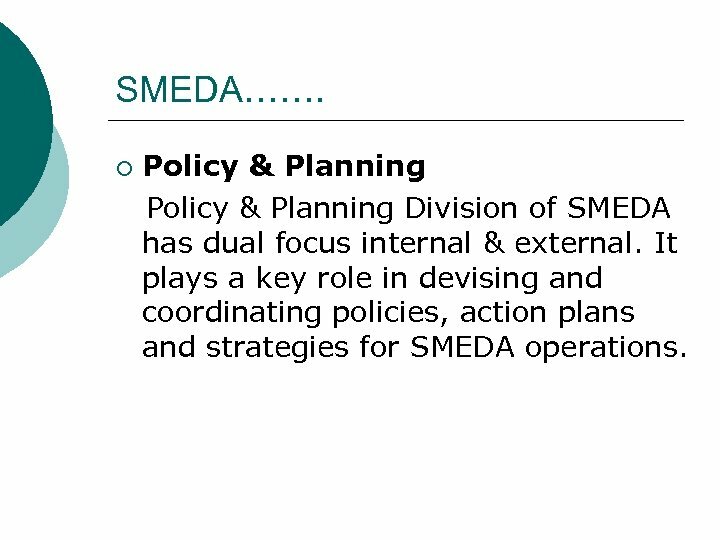 SMEDA (Small and Medium enterprises Development Authority) Introduction Premier institution of the Govt. 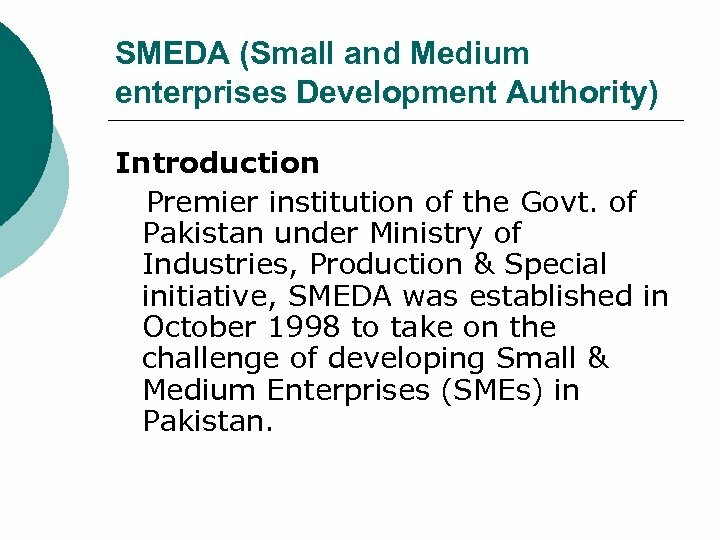 of Pakistan under Ministry of Industries, Production & Special initiative, SMEDA was established in October 1998 to take on the challenge of developing Small & Medium Enterprises (SMEs) in Pakistan. 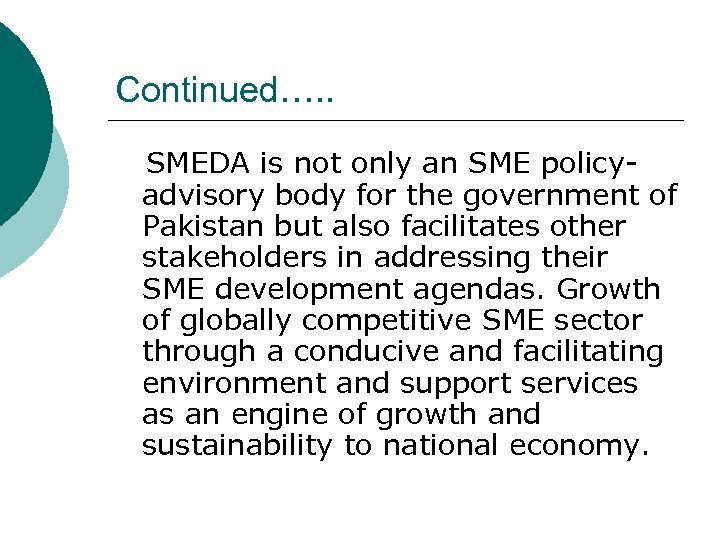 Continued…. . SMEDA is not only an SME policyadvisory body for the government of Pakistan but also facilitates other stakeholders in addressing their SME development agendas. Growth of globally competitive SME sector through a conducive and facilitating environment and support services as an engine of growth and sustainability to national economy. SMEDA…. 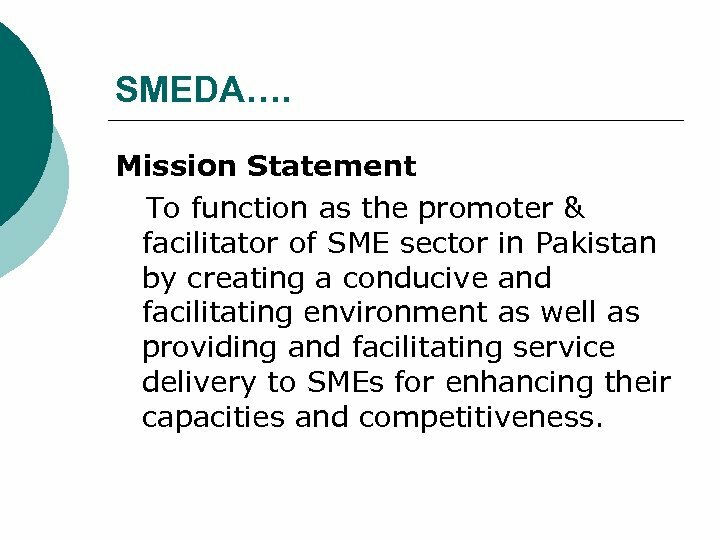 Mission Statement To function as the promoter & facilitator of SME sector in Pakistan by creating a conducive and facilitating environment as well as providing and facilitating service delivery to SMEs for enhancing their capacities and competitiveness. 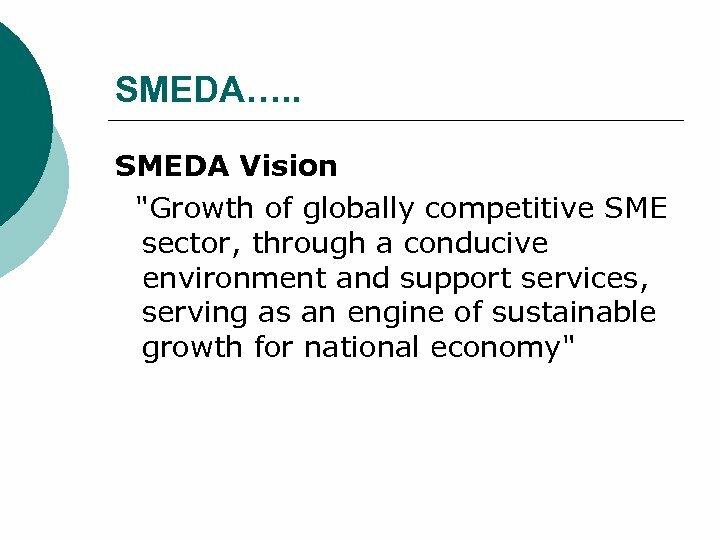 SMEDA…. . SMEDA Vision "Growth of globally competitive SME sector, through a conducive environment and support services, serving as an engine of sustainable growth for national economy"
SMEDA…. . SMEDA Objectives 1. 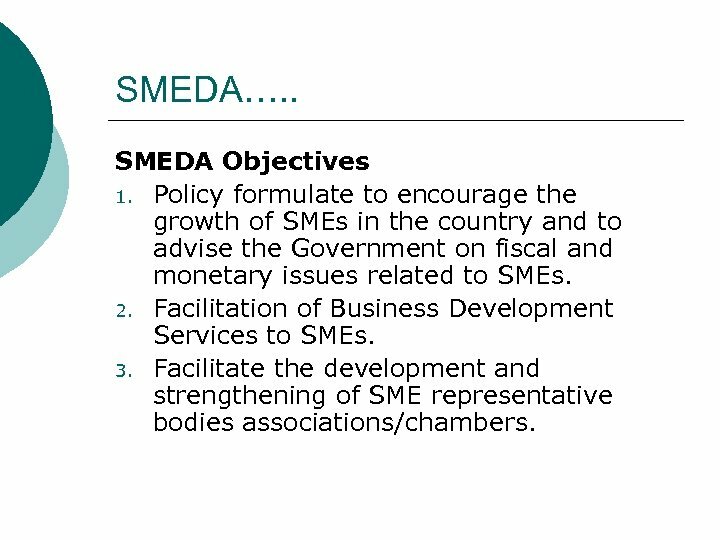 Policy formulate to encourage the growth of SMEs in the country and to advise the Government on fiscal and monetary issues related to SMEs. 2. Facilitation of Business Development Services to SMEs. 3. 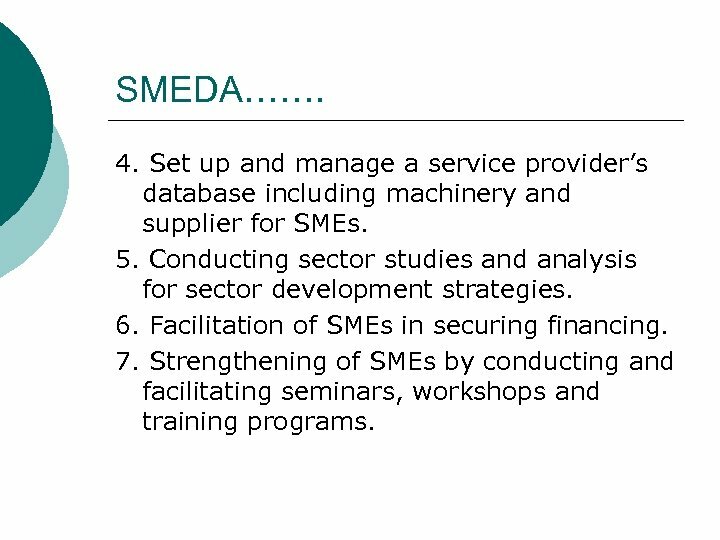 Facilitate the development and strengthening of SME representative bodies associations/chambers. SMEDA……. 4. Set up and manage a service provider’s database including machinery and supplier for SMEs. 5. Conducting sector studies and analysis for sector development strategies. 6. Facilitation of SMEs in securing financing. 7. Strengthening of SMEs by conducting and facilitating seminars, workshops and training programs. SMEDA……. 8. 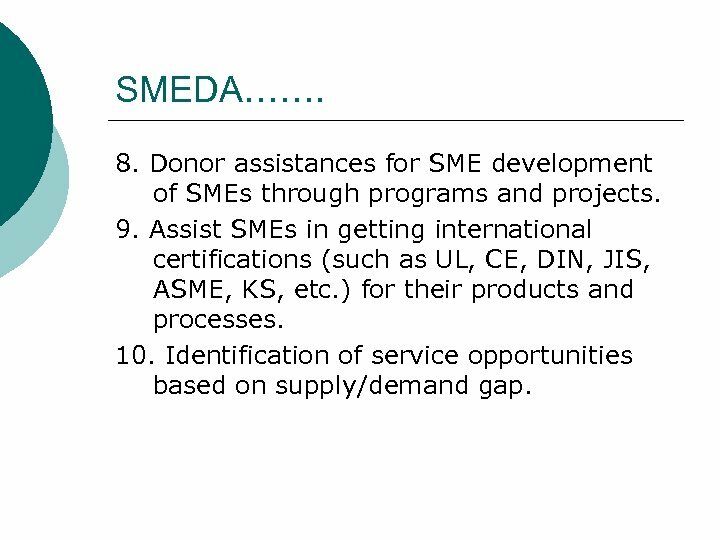 Donor assistances for SME development of SMEs through programs and projects. 9. 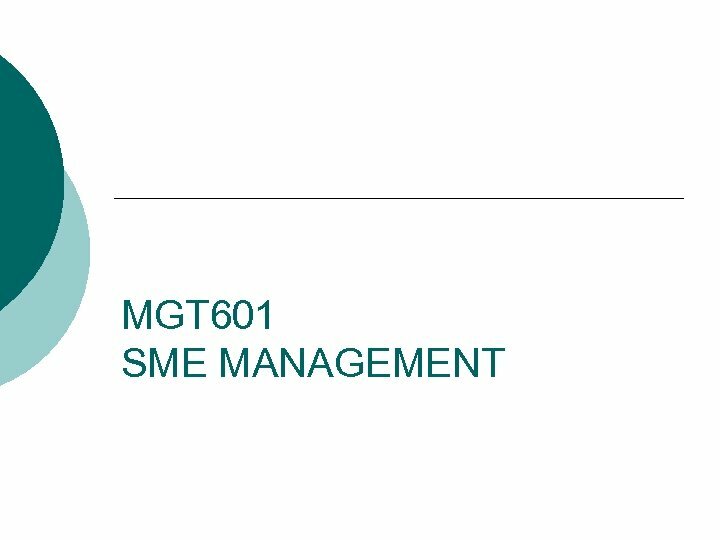 Assist SMEs in getting international certifications (such as UL, CE, DIN, JIS, ASME, KS, etc. ) for their products and processes. 10. Identification of service opportunities based on supply/demand gap. Continued…… On the other hand it has a mandate to carry out research, communicate with stakeholders and advocate policies with different tiers of the government with an ultimate objective of creating a conductive business environment for SMEs in Pakistan. 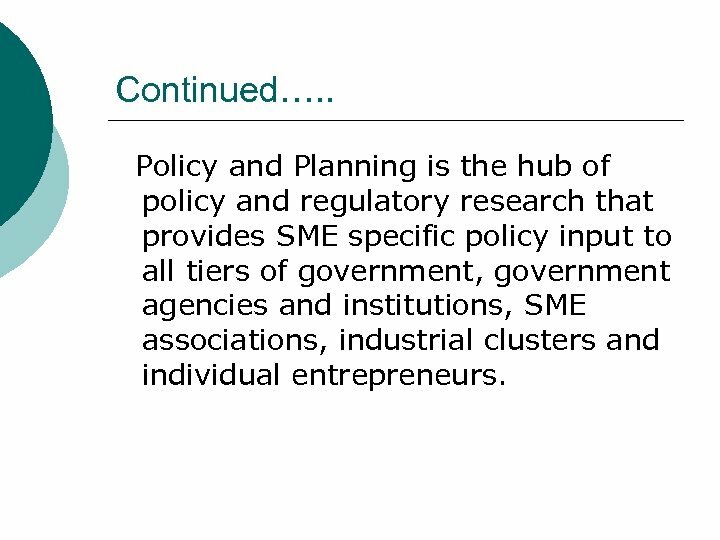 Continued…. . Policy and Planning is the hub of policy and regulatory research that provides SME specific policy input to all tiers of government, government agencies and institutions, SME associations, industrial clusters and individual entrepreneurs.